Zoe Benson is a 12.5-inch fully articulated fashion doll with fully rooted hair and hand-applied eyelashes. Zoe comes dressed in a modern look that includes a black satin mini-skirt and a white shirt with ruffled detail and a perfectly scaled black ribbon tie. 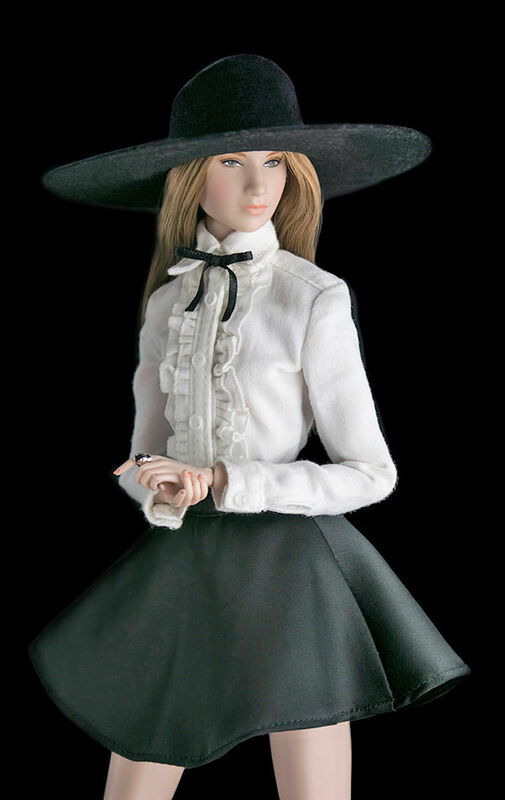 She completes her bewitching look with a large brimmed black hat, an oversized finger ring, short black socks, short faux-leather boots and a doll stand. Recommended for adult collectors ages 15 and up. Portrayed on-screen by actress Taissa Farmiga, Zoe Benson is a Council member and a witch at Miss Robichaux's Academy for Exceptional Young Ladies on American Horror Story: Coven™.